Purchasing good dry pet food is extemely difficult. This is mainly due to misleading information by manufacturers and false posting on the internet. Many people buy dry food out of convenience or unique reasons. But a completely dry kibble diet generally creates long term issues for your pet. If you really must, get the most appropriate. No point saving a few dollars now and give back a lot more on expensive medical costs later. 1. Ingredient list - Look for high quality meats. Watch out for fillers. They boost the analysis content but are actually substances which cannot be digested/absorbed. Some items/grains like corn, soy, gluten & yeast can cause severe allergies or sickness. A high carbohydrate level is harmful to cats in the long run. 2. Manufacturer ethics - Procter & Gamble who owns brands like Iams, Eukanuba conduct horrific animal testing. Colgate-Palmolive is another. For these large conglomerates, profits is the driving motivation. Not concern for your pets. 3. Rotate/Mix - There are always pros & cons to each brand. Either the wrong proportion of nutrients or missing something. Best to is rotate/mix among a few good brands so you will always be covered. In addition, the pet will not get bored on a single diet. 4. Ensure your pet has a source of clean water all the time. - This is critical to their health no matter what diet they are on. A trend has been to produce dry food which mimicks the cats' natural hunting environment as closely as possible. Cats are obligate carnivores and thrives on a highly meat-based diet. Ideally, it will be a high protein, mid/low fat & very low carbohydrate diet. Completely or almost completely grain-free. Home-prepared, BARF seems to be another trend. Kindly do your own research on BARF. Do ensure the recipe contains enough nutrition. and observe how your pet is doing with it over time. Animals are not all alike. Just remember NOT to feed cold. Last edited by xtrname; 06-11-2015 at 02:54 AM.. These are commonly found brands in Sg. The list is meant for a generally healthy cat. Cats with specific health issues/allergies need to be diet specific. High protein diet is generally NOT recommended for cats with kidney/renal problems. Protein to Carbohydrate Ratio	- The higher the better. Easier for ranking since the task is to identify a high protein, low carb diet. Sources can come from meat or plant. Many manufacturers include plant protein or low quality protein to boost the analysis precentages. Plant protein is useless to cats as they cannot metabolize them. So the real protein usable by cats can be much lower, leading to deficiency. Plant protein include grains like corn, gluten meals, maize, soy which are harmful in the long-run. Animal/meat protein can also be good or bad. It is classified on a scale of nutritional value. The highest being eggs, chicken, fish, muscle meat, lamb and such. By-products like claws, hair & nails are the lowest. Technically still protein, but useless. 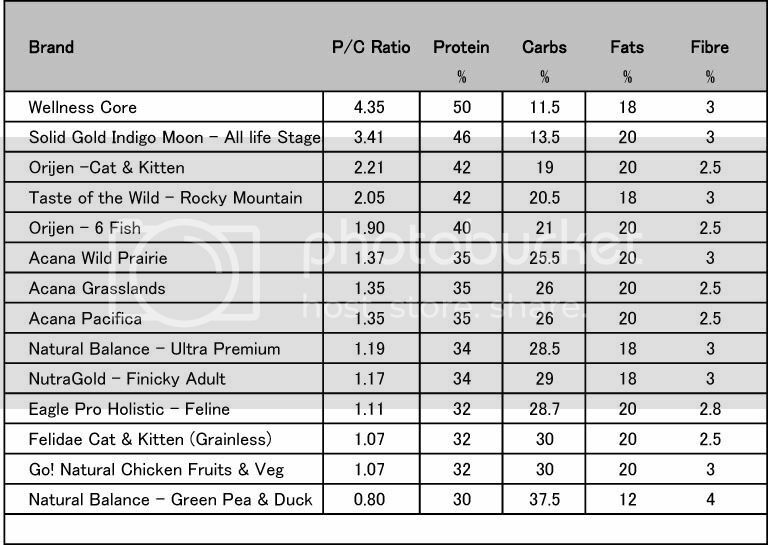 The table is in criteria of non-plant and high nutritional value protein. Energy source almost useless to cats and harmful in the long run. The high carb levels are usually due to high grain/plant content in the ingredients. Fibre - Some conflicting opinions of fibre need in diet for cats. Matters more to cats with health issues and on a prescription diet. Small proportions of good quality grains, like brown rice in the ingredients list is not an issue. It's the meat protein to carb ratio that we are more concerned here. The order of items written on the packaging goes by weight. So, ideally good quality named meats like chicken or chicken meal should be the first items. Not white rice, poultry (unnamed) or byproducts. nb. i did this research a few years ago. Petfood formulas may have changed a little. But it won't be too different. Last edited by xtrname; 06-11-2015 at 02:57 AM.. These will be the relatively better dry food. based on the cats' natural high protein/low carb diet. Grain free content. Mainly land-based meat source. Contains good quality ingredients. Claimed to be human grade sources. Taste of the wild -Rocky Mountain Feline. But their Kats & Flocken flavor contains poorer ingredients. Acana -Wild Prairie or Grasslands. Good quality ingredients but with some issues. Rotating/mixing with the better brands will overcome some of these problems. Good quality ingredients with much meat content. High on carb level. Contains some grains but nothing really harmful like corn (gluten). Whole grains contain some nutrition but should not form bulk of the ingredients, ie should be lower on the list. Top of the list. Good quality ingredients. Among the best protein to carb ratio. Grain free. Unfortunately, read that its manufacturer has some ethical issues but couldn't find the details. Good quality ingredients. But high on the carb level and contains some controversial items like Brewer's yeast which apparently causes allergies in some cats. Conflicting info found on brewer's yeast. nb i did this research a while back but i doubt much has changed. My choices were not strictly on food quality but also manufacturer ethics. Last edited by xtrname; 06-11-2015 at 03:05 AM..
Has been targeted by animal organizations and independent groups for questionable quality. And/or cruel and lethal animal testing, or unethical marketing or a combination of all these. Make your own judgement. But personally, with so many choices available something better can be easily found. (The concerns with Science Diet is their range of regular petfood. Less is known about their prescription range for cats/dogs with health issues. Last edited by xtrname; 06-11-2015 at 03:16 AM.. There seems to be many smaller shops now with good ethics in their business and treatment of animals. Find out more by asking questions about what they do. Pets Station - Unethical breeders/puppy mills. Complete disregard for animal lives. Attempted to use hamsters as a marketing free gift. Constantly reported in forums and news over mistreatment of various animals over the years. Link : Hamsters as Free Gifts with $25 purchase. Went today. The place is horrible horrible horrible. The lights where the pets are kept are off, unless have customers wanna take a look. Meaning they are in perpetual darkness most of the time. Most of the cats there have eye infections, a couple with running noses, and saw one with injuries around ears and eyes. The litter tray was obviously not cleaned for some time, considering that a few cats are sharing just 1 and that with minimum level of litter sand in it. Ask the staff and he all dunno. How old? Not sure. What breed? Er... dunno. God, the kittens there dun look more than 1 mth old!! This pet shop has it's own farm, so it's breeding it's own stocks for sale. I dare not imagine the environment at the farm considering the environment in the shop. This is also the same chain that runs the shop at Jurong Pt. The situation there is only slightly better. It also runs a branch at Causeway Pt, but there dun sell pets cos it's inside the mall. Animals and dogs don't seem to be kept in good conditions. Source of animals also dubious. Last edited by xtrname; 06-11-2015 at 03:41 AM..
Ppl often buy those cheap brand of dry food to feed their cats due to cost restraints. Especially those old aunties/uncles feeding the community cats. Some of them earn little so they couldn afford to buy gd quality foods for their cats. When i tried the wellness, onli my 1st and 2nd cat will eat. The 3rd one simply never touch that food. 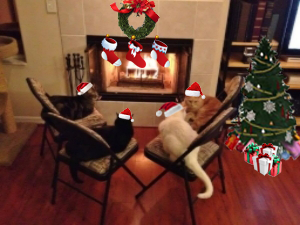 For Orijen case, all the 3 cats nevr touch it. So in the end i just feed them iams. There's another brand called "Fish for cats' I heard it don't contains any fillers. Its a new product into the market just less then a yr.
Last edited by CatLuVer; 16-08-2010 at 09:20 AM.. Try mix & change slowly. Im sure can be done over time. Can try so many other brands besides orijen. The Iams case is really very cruel. It's only 2 years ago during the melamine petfood recall when P&G/Menu foods attempted to cover up the truth. They refused a recall even when they found out animals were dying. Only under pressure they relented. They are always doing recalls for distributing tainted food. This is happening NOW. Please don't support them just for the sake of convenience. What is the message we are sending out? What is the point of preaching kindness to animals. **** man, i'm feeding my cat innova evo. What brands to get then? Although i'm feeding my cat barf diet mainly but i always have dry food set aside for him. You are really treating your cat very well. Good feeding & top range products. Innova Evo was manufactured by Natura, with their whole range well recommended. It is among the top with Wellness Core, Orijen, & a few others not available here. Unfortunately they were bought over by P&G. Once these big conglomerates buy them over, they will start tampering with the formula & streamlining the manufacturing to save costs. Eukanuba, Iams, Innova, and whatever under P&G are now manufactured by Menu Foods. They are a notorious sub-contractor. Ingredients will all be from the same source, namely China. Formulas will be changed for mass production savings by using the same facilities. So when production is tainted, it will hit several brands. This caused a huge change in quality. Many good brands suffered the same fate after being bought over. P&G bought over Natura a few months ago only. You may want to consider trying other brands. I stopped believing that dry food can ever be of good quality a long while ago. No matter the ingredients or brand its still cooked biscuits. I can't see how much nutrition we can get out of preserved stuff. Supermarket brands may be cheap but when you look at whats inside the packet like canned food for example, you'll see that it's almost worthless stuff layered with jelly which companies add to fill up the can and this makes it completely not worth buying. You might as well have just bought a can of rocks. Its like wanting to buy a sofa. You can't afford a $5000 full leather one so you settle for a $500 plastic one. The plastic sofa breaks after you've used it 10 times. You may have saved $4,500 not buying the leather one but by buying the plastic one you might as well have not bought anything because although the plastic thing was a sofa in name, it didn't serve its function. It's $500 gone to complete waste. Feeding our pets isn't a science. Companies don't have anymore idea on what animals ought to be fed than most of us do. People who face financial constraints like the uncles and aunties who feed community cats (bless their selfless souls) can try feeding cooked chicken meat. It's fresh, cheap and you can get a lot of it for only a few dollars at the wet market. It's much more cost effective than buying expensive processed food. Last edited by tkdg3r; 17-08-2010 at 01:19 AM..
No wonder innova evo seems to become much more expensive now. I can't find orijen in oz anymore. And i dun believe in letting my cat eat unhealthy food either so i always go for the best nutrition value for him. Seems like Eagle pack is off the list as well judging from wiki. WellPet - In October 2007 Eagle Pack was sold to Berwind Corporation for an undisclosed amount. In August of 2008 Wellness/Old Mother Hubbard was sold to Berwind  for $400 Million, generating a 7x profit on Catterton's initial investment. Between 2008 and 2009, Eagle and OMH were merged into a single entity, Wellpet LLC. Around 90 of the company's 200+ employees are salespeople. In 2009, a lawsuit was filed against Wellness and PetCo, alleging that Wellness's claim of "human grade" was untrue, and that the food contained feathers and non-human-grade cuts of meat. Dunno what brands to go for already. I believe in a balance of both dry and wet food though. Buying fresh chicken meat isn't as cheap as buying barf as well. Economically still cheaper for me to get barf for my feline. Orijen, Acana, Solid Gold, Taste of the wild is worth considering if anyone really wants dry food. But as often repeated, cooked/raw barf diet is the best. There will always be a demand for dry food so at least try to use best among them if you really have no choice. They must be supplemented by other types of food. Uncles & aunty stray feeders very seldom feed only 4 or 5 cats. There only seem to be a few at each spot but the numbers add up easily above 20. It is physically very tiring. Feeding alone can take hours. The irony is assuming they have the time & energy, they usually won't have the financial means. Last edited by xtrname; 17-08-2010 at 04:12 AM.. Currently i always buy those small iams 1kg packs onli, - this pack can last me for more then a week. Cos i'm also feeding wet can food everyday and 4times a week my mother will boil fish and give them. During those days when feeding fish my 2nd and 3rd cat will eat the fish bit by bit the whole day and won't touch any dry/can food. Onli my eldest cat will not touch any fish, so must feed her those wet can food. becos of the iams article i now wanna change their dry food diet. Hopefully can get some samples and slowly change theidry foos brand. It may be difficult. But it can be done with patience. The end results will be a lot more than just a change in diet.